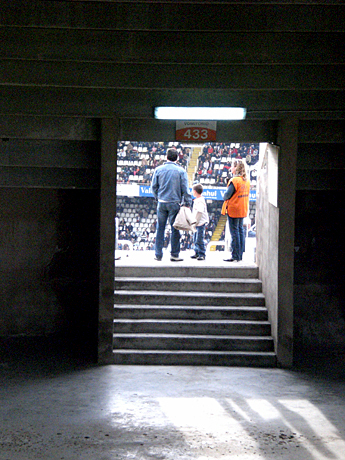 The Mestalla – Go While You Can! We went to the VCF-Mallorca match yesterday. It was a horrible game — uninspired soccer from the home team, ending in an embarrassing 0-3 defeat. So, let’s concentrate on something more interesting: The Mestalla. This is one of the best stadiums I’ve ever been to. We’ve been sitting in the cheap seats — La Grada de la Mar — which is a decision I can whole-heartedly recommend. Only €15 for a good bird’s-eye view of the action, plus an incredible panorama of the city over the stadium’s western wall. If you suffer from vertigo, though, I recommend choosing seats further down. The terrace is incredibly steep. 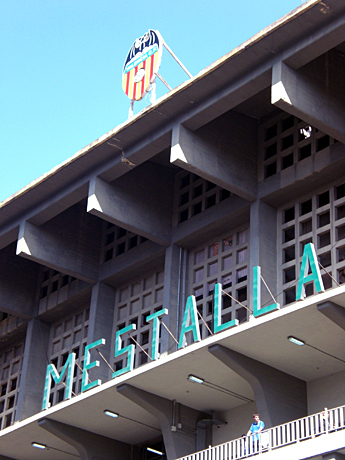 The Mestalla was inaugurated in 1923, and has played an important historical role in the city ever since. During the civil war, it was used as a concentration camp and storage area, and in 1957 was almost destroyed by the massive flooding that devastated Valencia. But like the city itself, it came back better than ever. 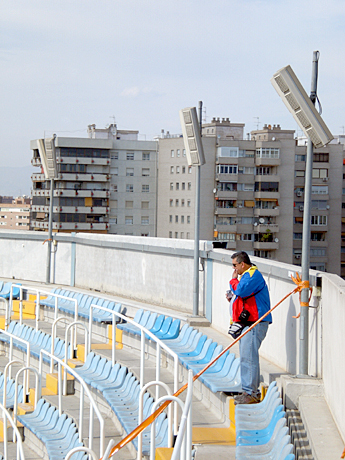 Over the years it has added more and more seating (the terraces of La Grada de la Mar are clearly a new addition), and can today seat more than 55,000 spectators. 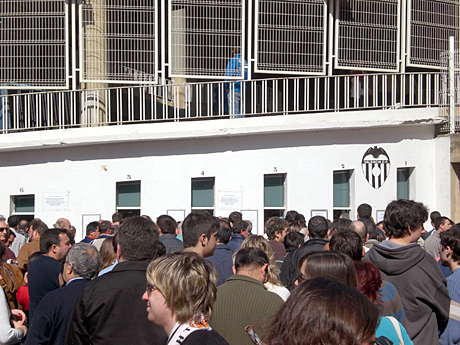 But if you want to experience a Valencia CF match in the Mestalla, don’t delay, because it’s being replaced. 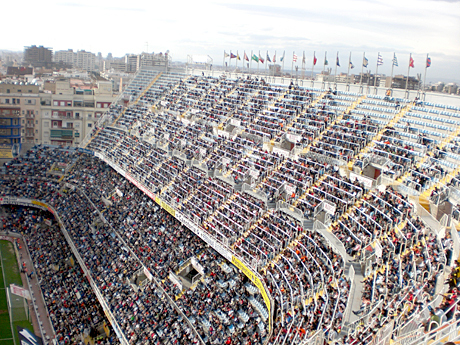 The Nou Mestalla is scheduled to open in 2009, close to the Palau de Congressos (location of future site). Not quite as central as the old Mestalla, but still within walking distance of the city center. 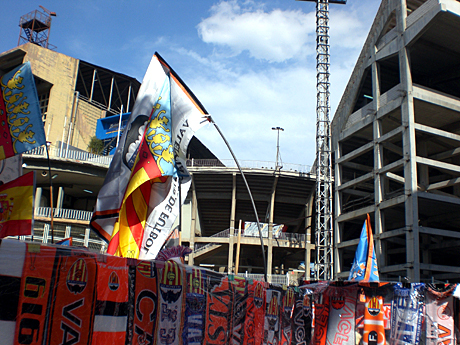 Until recently, I had been privately critical of the new Mestalla. 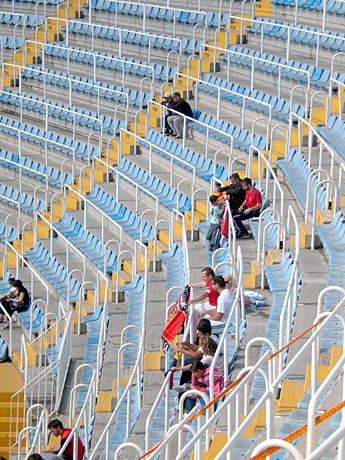 Ridiculously, I (an American, who’d been to 2 matches) had developed a sense of allegiance to the old stadium. Well, my ridiculous loyalty didn’t prove to be very strong — after watching the 2-minute introductory video for the new stadium, I abandoned it entirely. And now, I can’t wait for the future to arrive.